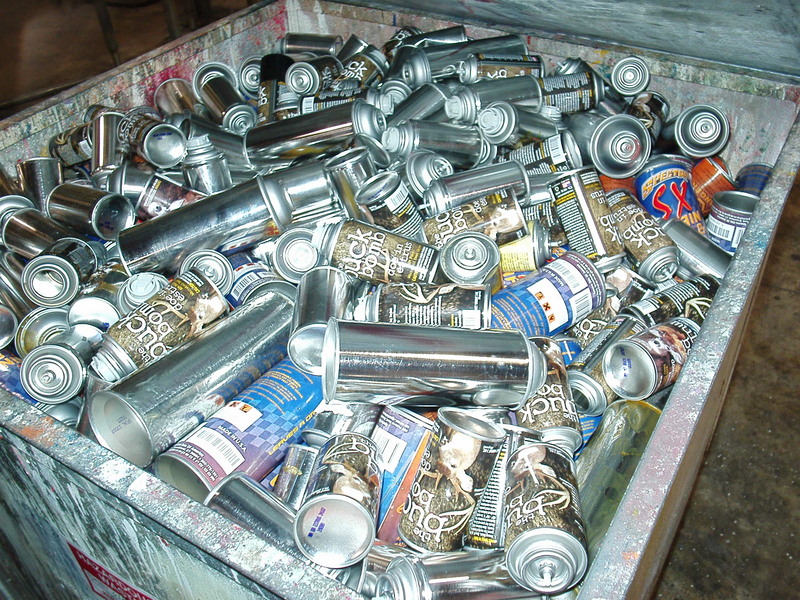 Do you know that partially filled aerosol cans are treated as hazardous wastes by many states? Do you know that it is not “environmentally” appropriate to dispose of these oft-used cans arbitrarily on empty landfills or recycle bins? Insecticides, spray paints, gels, mousse and pesticides- there are a number of regularly-used items which are available in aerosol spray cans. If you are using them then you should also learn about the proper aerosol can disposal system. Read on to learn more. Why are aerosol containers regarded as hazardous wastes? Aerosol cans contain propellants packed under pressure. The propellants are responsible for forcing the product out of the container when the nozzle is pressed. It (the propellant) is highly volatile and prone to explosion when it comes in contact with heat. So, it becomes imperative to drain the propellant out of the can before dispensing it to the trash. The propellant can be punctured out and then thrown away to the trash can. A totally empty aerosol container is not exactly treated as hazardous waste. However, if you think that there is still some product left in the container you can definitely give it to someone to use it if you yourself are not using it soon. How should you dispose aerosol cans? However, if there is some propellant left you should either puncture it or take it to the hazardous waste facility. Please refrain from flattening or puncturing the can on your own since that these cans might explode even while puncturing. Take them to individuals who are licensed to puncture cans or else ask the people at the hazardous waste facility whether they have puncturing facilities or not. You can empty spray cans on your own by spraying them continuously on newspapers until the hissing noise from the container stops. There are certain instances when users are still not sure whether the can is totally empty or not (even after doing this). So, they can jolly well take these cans to licensed puncturers. Make sure you are taking these aforementioned steps before disposing the can to the recycling bin as well. There are several states which might even end up imposing a fine on you if the can disposed by you explodes in the recycling trucks. You can check out if there are nearby recycling facilities or not. Since the aerosol cans are made up of steel and aluminium (mostly) the recyclers usually accept them (since both steel and aluminium are highly recyclable products). Some of the recyclers might even pay you a small fee for recycling these cans. Find out if the local recycling facilities in your state offer such fees or not. However, irrespective of whether you get a payment for recycling aerosol cans or not, you must always seek opportunities for recycling. Check out if your state follows specific regulations regarding aerosol can disposal or recycling or not. Hope the points mentioned above will turn out to be of considerable help when you are looking to dispose those oft-used aerosol cans the next time!